This is in Florida, which has a very tightly regulated alligator hunting season. An alligator is such a bizarre, unusual sight in the waters of the Upper Mud River that even seeing isn’t necessarily believing. 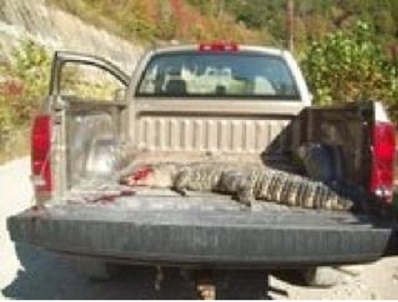 Fishermen over the past several days contacted the West Virginia Division of Natural Resources to tell them of the gator sighting. On Saturday, Nick Huffman, a field superintendent with the DNR, saw the scaled reptile with his own eyes. The DNR shot the alligator and pulled it out of the water. The alligator will now be dissected. Opening the alligator’s stomach may give the DNR some insight as to where it may have come from and how long it was in the river. West Virginia has almost no regulations on alligator ownership– probably because most people have sense enough not to own one! But I have seen alligators and caimans available at pet stores, and every once in a while, someone releases a pet alligator into a river or lake in hopes that it will survive in the wild (I guess). The problem is that alligators live only as far north as northeastern North Carolina. There is some debate about about them having an historical range into southeastern Virginia. I’ve always heard that the Great Dismal Swamp was the northern boundary, but I’ve also heard that alligators once ranged into the James River. In North Carolina, they are found only in the coastal plain, where the winters are comparatively mild. My guess is if they were found in Virginia at one time, they were never found out of the extreme southeastern part of the state, and if they did occur in the James River, my guess is they were found only near the coast. If they aren’t found outside of North Carolina’s coast plain, how on earth could they survive in West Virginia? People are amazingly dumb about animals. Alligators are not good pets. I’m surprised I had to type that sentence. An alligator can eat you. It has very powerful jaws and a relatively small brain. And although they are smarter than, say, iguanas or box turtles, they are about the same level of intelligence as a chicken. Powerful jaws and a small brain are a combination a combination for a dangerous pet. Oh, yeah, and you need a massive heated enclosure that contains both a swimming area and a basking area, which has to be cleaned on a regular basis. But if you get one and live in one of these states that has an actual winter, please don’t dump it in the local river. It’s either going to freeze to death or someone is going to shoot it. There is no “born free” scenario that works out well for the alligator. But some people just don’t care. One of the most interesting alligator populations that has been established outside their normal range is the Tennessee River in northern Alabama. Most of these are on the Wheeler Lake Reservoir. Alligators are native to southern Alabama, but they were introduced to the Tennessee River at some point in the 1960’s or 1970’s. These alligators are outside their native range, and they also are living in a somewhat cooler climate than they normally would experience. However, even northern Alabama has much milder winters than West Virginia, and there is no chance of them ever becoming established here. It looks like this alligator got a yellow Labrador. This is an old story, but I somehow missed it. Um. Contrary to what that fellow says, alligators aren’t as safe or safer than domestic dogs. For one thing, a dog is domesticated. It also has a relatively large brain, so it can learn rules and be safe. The person who put this up on youtube has a channel called the AlligatorTrainer. I’m no expert on crocodilian husbandry, but these little alligators don’t look all that healthy. I don’t think this is going to end well.